Recently, I outlined some local SEO strategy and actionable insights on making your local business ideal for ranking high on Google’s Local Results. Now, successfully ranking here still boils down to your on page Local SEO efforts. This basic setup is what provides Google with the exact information they need to rank your website in local results, and without that, you’re likely to be misidentified by search engines. Similarly, you can’t rely on just your regular SEO efforts to help your local business ranking high in local results. The main reason for this is that many local searches are done on mobile devices, which have a completely separate results list from the desktop results. Local Search is processed in a different way compared to other types of search. At the same time, Google tends to separate good local results from general results – after all, their main goal is giving searchers the best possible results, and that means segmenting search results in a way that helps people. Essentially, it’s their version of segmenting an email list to only display certain offers to certain subscribers – one of the fundamental principles of modern inbound marketing is that targeting your audience is better than trying to advertise to the general public, and search engines have put a lot of effort into doing that. 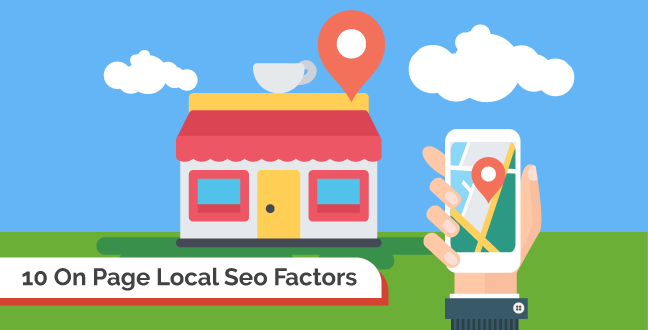 With that in mind, let’s look at the ten local SEO factors you need to ensure a good rank in local SEO. On page Local SEO essentially comes down to including vital information on your website commonly associated with local business. In particular, we want to make sure search engines found things like address, contact information or opening hours to be able to recognize that your website represents a local business. In addition to having these in plain text, another important thing to have is to add Schema for local SEO. Adding Schema Markups allow search engines to identify key pieces of information and separate them from the rest of your content. For example, you might include other address as example in your content and not as your business address. 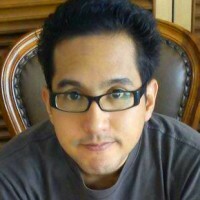 If search engines already found an address tagged with Schema they will ignore the rest of them. Think of them as help signs telling search engines that this content means something specific. The full list of Markups related to Local Business can be found right here. Meanwhile, the three main things your website needs are what is known as NAP – your Name, Address, and Phone Number. Name, Address and Phone format should be consistent in everywhere you add them online for Google to be easily able to relate them. Your business name should be displayed on your website, along with any relevant extensions to it (pte, ltd, etc. ), and this should be consistent with information you’ll be submitting to directory sites and social media. Consistency really is important here – without it, search engines might not be sure that these accounts are associated with each other, and they’ll be more reluctant to give you the benefits of those links. Note the importance of the word “legal” before “Name” here. For Local Businesses, schema markup tags are split into the Organization, Place, and Thing categories – and the basic “Name” tag is used for the names of items, not the name of your company. Don’t confuse the two. Your address is another particularly important piece of information if you operate a physical location – and again, it should be exactly consistent with the information you submit to other site. To be frank with you, there’s never a time when that isn’t true – but sometimes companies have different people submitting information to different sites, and those people don’t always write things the same way. Errors are especially common if the company has multiple locations people are working out of. It’s generally a good idea to include every number you have on your website and in your schema markups. That said, since you really only have room to display one at the top of your page, limit that to your main phone number. All the other numbers should be on either a “Contact” page or down at the bottom of the screen. Always include the contactType tag with your telephone numbers – Google may decide to display different numbers to people at different times (if, for example, it thinks they’re looking for help instead of information), and being able to differentiate between them makes it easy to provide what people are looking for. 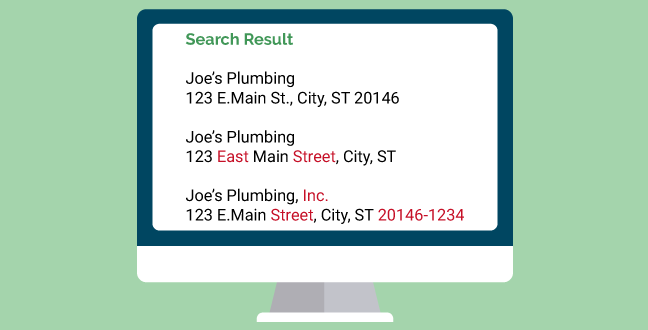 In addition to your Name, Address, and Phone Number, there are several other pieces of information that are used to determine local search results and Knowledge Graph displays. 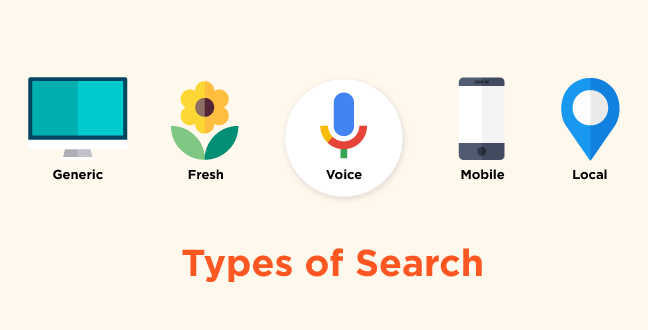 These aren’t as important as the main three, but including them will put you in the best position to rank well in Google’s search results. One of the most important things to pay attention to here is what each section is for. On our home page, for example, you’ll note that one part includes “http://” and the other doesn’t. This is quite intentional, since once of these is meant to be the actual link while the other is what’s displayed in results. Our main goal here is getting good results in Local SEO, but it’s always important to think about the end user and what will look best to them. If you’re not sure which part of the schema markup means what, talk to your website’s coder and ask them to explain it to you. Providing your operating hours tends to result in a more complete display in Google’s search results – and, just as importantly, it helps users understand if you’re currently open for business. After all, you don’t want to be attracting people when you’re closed – and many people using Local SEO who can’t visit right away won’t bother to come back, so it’s rarely worth trying to get their attention when you’re not available. Most of these results are displayed in a days and hours format, and that’s how they should be written. Here’s another case where the exact data entered and what’s displayed to users may be different. Naturally, this is a little more complicated for businesses that have irregular hours – if that applies to you, you’ll need to do a little more research and figure out the format that best fits your situation. Business logos are vital because they tend to show up in Local Card and Local Search results. Companies that don’t have a logo to display tend to be seen as a little less trustworthy by people, and they may be less inclined to come into your store as a result. Similarly, you’ll want to ensure the image is properly tagged in schema so that Google actually knows which image is your logo. Without this, it’s forced to guess, and may ultimately decide not to display an image at all. That’s probably better than the alternative, since having the wrong picture can make your website look very strange indeed. This is definitely one of the easier schemas to implement, since all you really need to do is specify it’s a logo and provide the URL you’re using for it. That said, make sure to keep your logo in that place, and with that filename, until you’re good and ready to change it. Some people update their site and move things around without updating their schema properly, and that tends to throw a wrench into their local SEO rankings until they fix it. Short descriptions of your business can be added for search engines to extract and display under your name. Typically, this should be no more than two or three sentences at most, since there’s only so much that Google is willing to display (and visitors are willing to read). This is fundamentally similar to your website’s meta description, and indeed, some businesses use the same text for both. The most important thing to remember here is that the business description should concisely explain what you do and demonstrate how you can provide value to your visitors. If you’re a restaurant, highlight things like your services and style of cuisine. If you’re running a real estate business, talk about the homes you specialize in. Remember, people might see information about your competition as well – so it really does help to emphasize the qualities that make you uniquely valuable. This category specifies the sort of business you’re actually running, and it’s a key part of Google Local’s efforts to display relevant results. The full list of local business types can be found in the LocalBusiness section of this page. Be sure to check the full list. Many local businesses ultimately fall under one of the “store” subcategories, but some locations – such as automotive dealerships and dentists – actually have their own categories. If you can’t find a perfect match for your business, just pick the category that best matches you. Be sure your business type is located in the appropriate section of your schema. The “type” tag can be used to describe a number of different things (including temporary events and the like), and Google might not provide the best results if it’s located in the wrong area. Most companies have sites that are affiliated with their business, including things like social media profiles, Wikipedia entries, or local directories that can point people in their direction. By using the “SameAs” tag with schema markups, you can tell Google that those pages are meant to be associated with yours. It will check and confirm this – that’s a big part of why your name needs to be consistent across all of them – but if it’s satisfied with what it sees, chances are it will provide links to those places as well. This is an ideal way of reaching people who’d rather contact you over social media, so it’s absolutely worth keeping this up to date. This section tends to be in the main part of your schema markup, right under things like your legal name, web address, and telephone number. Addresses are good, but maps ensure that users and search engines know exactly where you’re located. 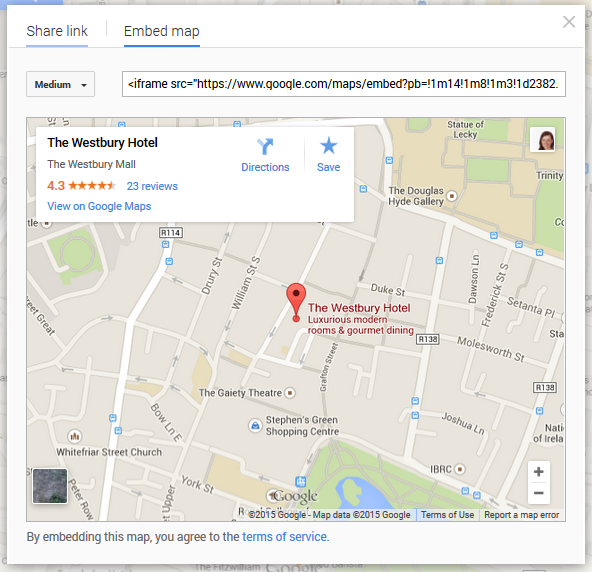 You can embed information from Google Maps (the only source you should use) directly into your website for this. Embedding Google Maps into your website practically guarantees Google’s understanding of the type and location of your local business. Venue Map can show a larger shopping area (like a mall) and help pinpoint your location within it. Everything we’ve described above can be done manually to set up your local SEO – but there are ways to ease and automate this process. Maybe you don’t have the time to spare to ensure that complex schema coding is written correctly, or maybe you just don’t want to have to learn all of that. 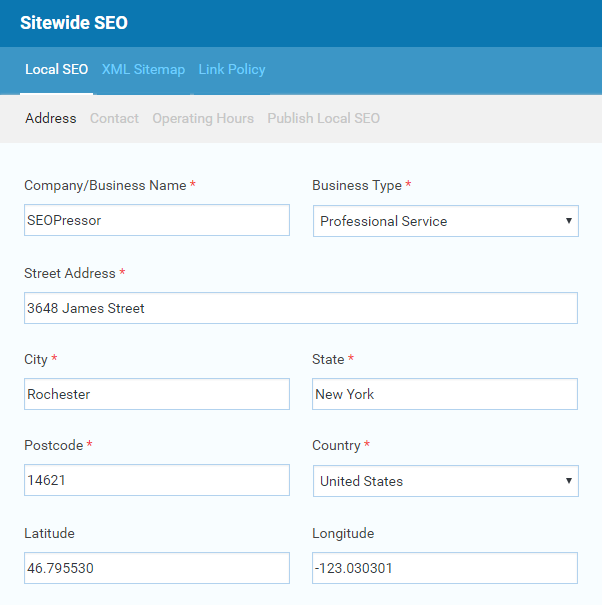 SEOPressor – SEOPressor has a local SEO setting where you just have to fill in your business details and it will automatically generate schema markups and local SEO widgets that you can include on WordPress sites. This is the best way to quickly get the coding you need, but it’s not the only thing you should do. SEOPressor Connect lets you add Local SEO setting without any coding. Google Structured Data Testing Tool – Google really likes it when your schema data is accurate, since that makes things easier on them. To that end, they offer the Structured Data Testing Tool, which will scan your website and alert you to any issues that may arise. SEOPressor is almost always accurate, but Google does occasionally change the schema rules, and this is the best way to be sure you’re up-to-date. It only takes a few moments, and there’s no cost, so it’s worth doublechecking to be absolutely sure. 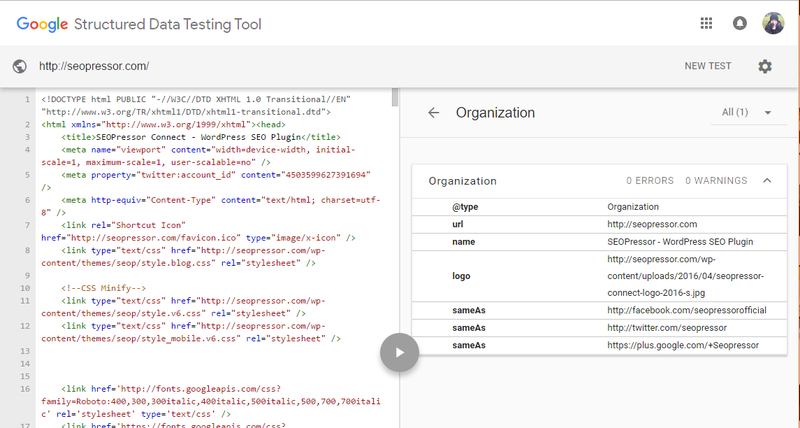 Google Structured Data Testing Tool can help validate your Schema Markup. Serplify – If you need some extra help with your site, Serplify is a powerful tool that can automatically generate local-specific sites for places of your choice. This is a particularly good option if you don’t have a website yet, or you do have one but it really isn’t up to modern coding standards. You’ll have to expand the website with your personal information, of course, but having a solid foundation will make your future success come that much easier. To properly rank in local results, make sure you set up everything on your website first, then proceed to do the off-page aspects like submitting to local directories and claiming the location through Google My Business. 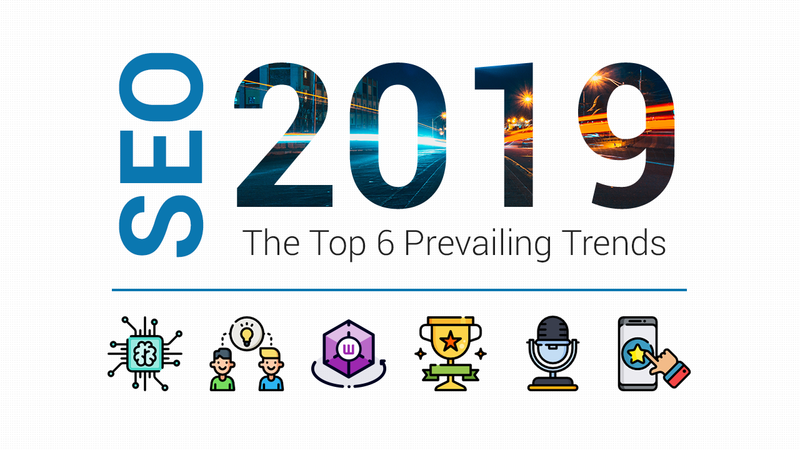 The truth is that doing well in local SEO isn’t actually as difficult as many people believe – in fact, it’s often among the easiest places to rank because there isn’t nearly as much competition. There are only so many stores of a given type in each region, and since you’re only competing against them, you won’t have to worry about businesses all over the country competing for their attention. Even better, once you’ve gotten your on page local SEO set up, there’s really nothing special you need to do to keep getting results from it. Simply maintaining your site, regularly posting blogs, and focusing on your normal SEO efforts will be enough to tell Google that your business is active, and that will ensure it continues to display you in local SEO results. It doesn’t really take that long to set your on page local SEO up, and the benefits mean it won’t be long before your efforts are repaid.